Dr Eugene Chadbourne is a multi producer. For various labels and recently for his own pirate label, he records CDs, LPs and (still!) tapes. For Grob he produced Any Other Suggestion (GROB.009, a few copies of this CD-R are still available) in 1999 and last year chadlehn - c inside, his duo with Thomas Lehn. One really doesn't have to introduce Chadbourne, who has been out and about now for over 25 years. He is a virtuoso of the guitar and banjo, a visionary of new and free music (he was a student of Leo Wadada Smith and Anthony Braxton and confidant of John Zorn), a foundational deconstructor of rock and above all of all forms of Country and Western music. He was an alternative rock star, back when no one could make money from this concept, and went further underground when the American independent scene mutated into main stream. He wrote the soundtrack of the first Simpsons series (rejected) and played the role of a horror film expert in Scream I (cut out). 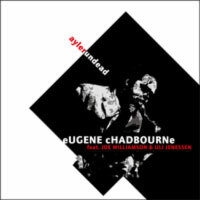 Amidst the welter of the legendary, unlistenable and uncool Chadbourne releases, Ayler Undead (recorded in Cologne in 2000 and in his home Greensboro) sticks out, not only because Dr. Chadbourne is presenting a new Free Jazz trio with the Berlin improvisers Joe Williamson (bass) and Uli Jenneßen (drums) and recorded a few unconventional overdubs, but more so because Ayler Undead is the first recording that is wholly dedicated to Albert Ayler and his music. The trio plays his compositions with one exception: Hendrix-like they destroy "La Marseillaise." Chadbourne makes two aspects of Ayler's music (again) very clear: the psychedelic and the free jazzy. The music is supplemented by extensive liner notes of the master, by graphic investigation of Sven von Redens on the complex "Ayler <--> Chadbourne" and by a statement of the producer Felix Klopotek. The post production and the mastering was done by Marcus Schmickler.